Today is a pseudo-Part V of our series on Muscle Cramps – I was tempted to call it Part V, but it’s a little bit of a departure from what we’ve been talking about. In our next post, which we will be calling Part V, we’ll wrap up this really challenging series and try to summarize all your comments and our posting into one post. But today, we build on the arguments from yesterday. In yesterday’s post, we looked at how hypothesis creation in science must be evaluated with observation, and if the measurement or observation contradicts or fails to agree with the hypothesis, then the theory requires revision! Well, today, we want to apply that analogy to the issue of fluid and electrolyte replacements. It’s an issue that we’ve touched on before, and even dedicated a post to, but it comes up so often in comments and questions, that we thought we should dedicate another post to it, and throw out some real figures, to prove a point. Let’s tackle that issue, with the aid of a regular runner – we’ll call him Randy. The first, and most important assumption, is that we will have to treat Randy somewhat ‘non-homeostatically’. I cannot stress just how important it is that we recognize that during exercise, the body is a finely tuned system, and is able to call on a number of different strategies for regulating its internal situation (this is called homeostasis). This is why we often measure things that are not predicted by equations – there are simply too many variables to factor in. For example, we often find that people do over drink, but they manage to regulate their body’s sodium levels – this happens because they have other sources of sodium – hormonal regulation, renal function, and maybe even release of sodium from bone! The point is that we have to look at the body a little bit “coldly” in order to evaluate these arguments – when we consider what is actually happening, then it becomes EVEN MORE APPARENT that the supposed failures and problems like dehydration and cramps are unlikely to happen! In other words, we will present a number of scenarios where Randy would run into trouble. In reality, that would not even happen, because the body is so well regulated. We must assume body weight – we have assumed that Randy weighs in at about 70 kg. This means that his total EXTRACELLULAR FLUID VOLUME is 17 L.
We also assume that Randy is what Gatorade would call a “salty sweater” – this is someone who has higher than normal sodium levels in their sweat. Gatorade themselves can’t define exactly what this means, but we’ve assumed that Randy’s sweat has a sodium concentration of 100 mM. Note that a fit, well-acclimatized person probably has sodium concentrations of about 20 mM, so Randy really is a “salty sweater”! Now, let’s take a look at some of the possible outcomes…. In this scenario, shown in the table below, we assume that Randy does not drink at all during his two-hour session. He therefore loses both sodium and water – 2 L of water to be exact, and given his very salty sweat, a total of 200 mmoles of sodium (a mmol is a unit for measurement of amount, by the way – for ease of comparison, I’ve included the mass of sodium in grams as well). As you will see, Randy’s sweat, despite the fact that it’s much saltier than most people’s, is still very low on sodium compared to his starting sodium concentration (which was 140mM). As a result, his sweat is HYPOTONIC, and the end result is that his sodium concentration GOES UP – it ends at 145mM. Note that it is normal, though on the high side. In fact, when we analysed Comrades runners during our research studies in 2005 and 2006, we found that most runners finished the race with a sodium level between 140 and 145mM, and they were fine. So this scenario is actually pretty good! 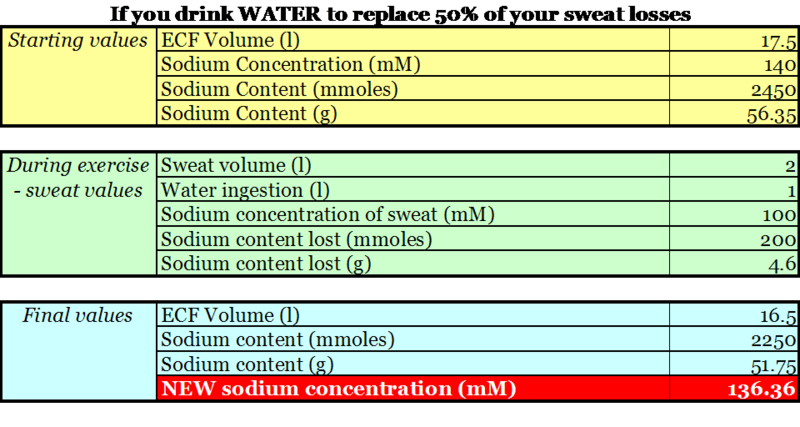 The table below shows the predictions for what would happen if Randy drank 500ml per hour – this is a reasonable rate for someone who drinks to thirst, though it does depend on the conditions. What you see from this table is that now, the sodium concentration will still be in the normal range of 135 to 145mM. Note that this scenario is again IDEAL – his sodium level is in the normal range, he’s been drinking to thirst (approximately) and his physiological situation is 100% normal. In fact, the ideal and most common scenario in reality is probably somewhere between Scenario 1 and Scenario 2 – about 30% to 50% of sweat losses replaced would see you finishing in a “normal” range. You will notice from the last line of the table that Randy is now HYPONATRAEMIC – his sodium levels have fallen below 130 mM. This is usually going to land Randy up in the medical tent and could even have fatal consequences – people have differing sensitivities to a fall in sodium, but a value of 129 mM would be consider dangerously low. Quite apart from this, Randy has managed to drink 2 L in two hours, and so depending on how quickly he was running, he might feel very ill just from the strain of drinking that much – I would challenge you to drink this much, unless you are running fairly slowly and it’s a hot day! Sweating causes some sodium loss, but because the sodium content of sweat is so low relative to body fluids, your sodium concentration will rise. And it is the concentration that is important, since this controls fluid shifts in the body. It is NOT possible, even for a “salty sweater” like Randy in these scenarios, to LOSE sodium through sweat. Rather, we have demonstrated that the only possibly theoretical way that the sodium level can fall is if Randy drinks too much. If he drinks more than he sweats, then he will really be in a lot of trouble. For example, if Randy took Gatorade’s earlier advice and drank 40 Oz per hour (1.2 L), then his sodium levels would fall to 125mM – OVERDRINKING can be FATAL. Now, some of you may be wondering what would happen if Randy drank SPORTS DRINKS instead of plain water? 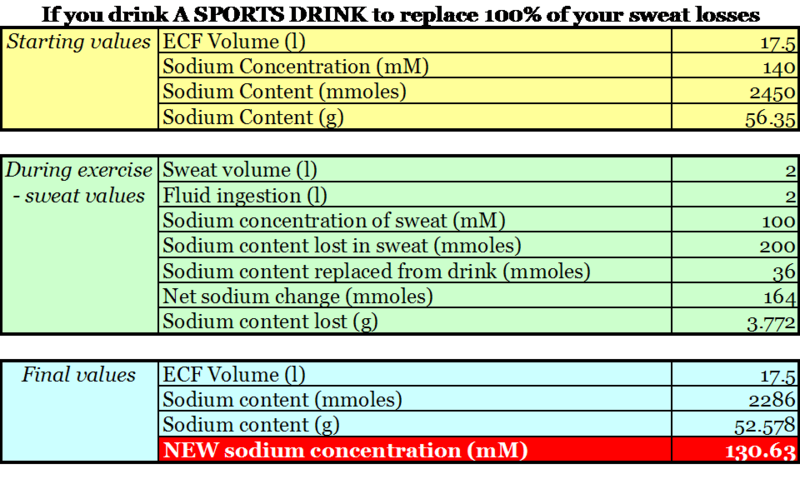 The theory (and the marketing by the sports drink companies) will tell you that the sports drinks are critical because they contain sodium, which replaces what you lose. Let’s look at these scenarios…. The first point we have to make is that Gatorade has a sodium concentration of 18mM – this is only 13% of what the body fluid concentration is, and only 18% of the sodium concentration of the sweat in our examples. It does not take a mathematician to work out that you cannot replace the losses if your replacement fluid is different from the original! But let’s play with the numbers and see. 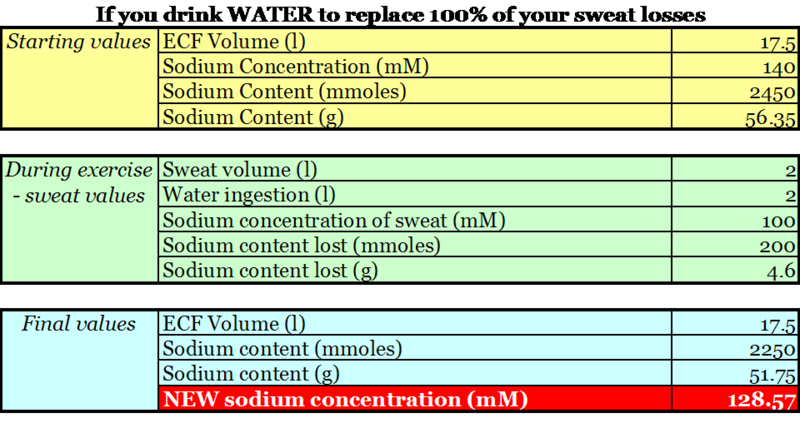 So, what this table shows is that Randy sweats out 2L in his run, and loses 200mmol of sodium. However, because he is putting some of those electrolytes back, his overall sodium loss is 182 mmol – this equates to about 4.2g of sodium. You may recall from scenario 2 that if he drank just water, his sodium loss would have been 4.6g – the difference is therefore 0.4 grams! When you consider the volume of 17L that this is going into, then you begin to realise that the sports drinks are making a tiny, tiny difference to the body’s sodium concentration! In fact, the difference is only about 1mM – Randy’s sodium level would have been 136.4 mM with plain water, and it’s predicted as 137.4mM on sports drinks! That difference is absolutely minimal – in fact, it’s negligible. A few people wrote in wondering whether a 1 or 2mM difference might be important – I can assure you that it’s not. If it were, then in the time you have taken to read this, you would have seen your sodium levels shift by this “critical” amount! So the bottom line – sports drinks simply DO NOT help prevent the fall in sodium levels caused by potential overdrinking. For our final scenario, consider what happens if Randy now drinks to replace all his sweat losses, but he drinks sports drinks instead of water. You may recall from scenario 3 that if he drank only water, his sodium level would be predicted to fall to 128.6mM – a level associated with hyponatremia. 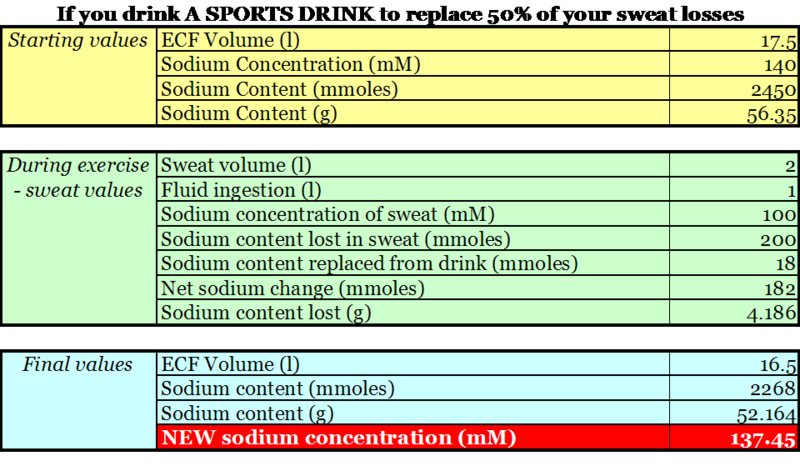 The table above shows that if he drinks sports drinks, then his sodium level will fall to 130.6 mM – this is a difference of 2mM compared to drinking only water. Again, this is a minimal, and negligible difference – the fact of the matter is that whether Randy drinks water or sports drinks, he still becomes hyponatraemic and could be running the risk of death as a result. Again, I have to emphasize – this difference of 2mM is insignificant – both final values are dangerously low, regardless of what he drank during exercise – and this was only in a two-hour run! To illustrate this, if Randy ran a full marathon and took 4 hours, following this same pattern of drinking to replace all his sweat losses with a sports drink, then his final sodium concentration would be 121 mM – he would almost certainly end up in hospital. Why? Because he drinks too much of a sports drink that is hypotonic and unable to defend the body’s sodium concentration. So, having run through these five scenarios, I hope it’s quite apparent that if your sodium level drops, it is NOT because you are losing salt, it’s because you are over-drinking! I hope it is equally apparent that drinking a sports drink does nothing to change this situation. So what to do? For our imaginary runner, the answer would seem quite obvious – don’t overdrink! That only seems obvious because we get ourselves into terrible states of confusion by talking about what overdrinking means, and should we also supplement with salt? The reality is that most people will finish exercise with a normal or slightly elevated sodium concentration – this is in fact the normal, and desired response. In otherwords, of the scenarios we have looked at here, the “ideal” probably lies somewhere between not drinking, and drinking about 50% of fluid losses. If you do this when you exercise, your sodium level will not change substantially – it will be neither too high or too low. If you are not thirsty, then don’t drink! Don’t waste money on salt tablets – you don’t need them! The problem that we (as a sports community) find ourselves in today, with this huge confusion, is the result of allowing ourselves to be treated as stupid. Yes, that’s right – the companies that sell sports drinks think that you are too stupid to drink when you should, and that your body is too stupid to realise when it needs salt! Our species learned how to make fire, put a man on the moon, and created a communication system that allows you in Colorado (or wherever you are in the world) to read the words I am typing in Cape Town! But when it comes to drinking – we’re just not capable! Surely that doesn’t make sense! In this post, we’ve tried to illustrate some of the theoretically possible outcomes when you drink plain water during exercise compared to drinking sports drinks, which contain electrolytes. What we have shown is that the electrolytes in sports drinks make a very tiny difference – not enough to prevent hyponatremia from developing and certainly not enough to back up the marketing claims made by the companies who tell you that you NEED the electrolytes. We have used these mathematical scenarios to illustrate the theoretical point – I just want to point out again that in reality, when you do drink water and sports drinks, your body makes adjustments that prevent your sodium level from falling (up to a point – eventually, your poor physiology would be over-stressed and you would start to run into trouble!). So the reality is that even if you do make the mistake of drinking too much, your body does the best possible job of protecting you anyway. One example of such a mechanism is that when your sodium level begins to fall, you are no longer thirsty, and the body is actually even able to release less sodium into the sweat, just so that you conserve it! It’s just as well that our bodies are so ‘smart’, because if we did not have these regulatory mechanisms, can you imagine how many people would be in serious trouble because they did not simply listen to the body and drink to thirst? So bottom line – drink to thirst, don’t worry too much about what you drink, but just make sure you are getting enough ENERGY in – the one thing that the sports drinks provide that is required is glucose, and so plain water is unlikely to be sufficient for longer than about 2 hours of exercise. So that’s it for today’s little ‘diversion’ from our series. Tomorrow we will wrap up the cramp series, and put our minds to what lies ahead!